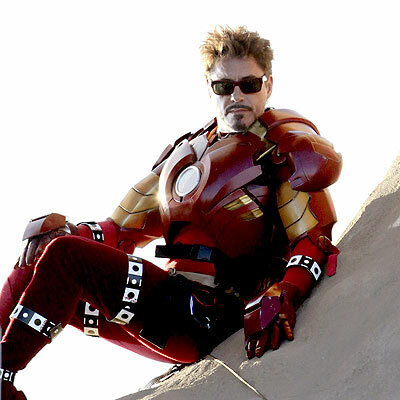 EW​.com have posted a new image show­ing Tony Stark in his Iron Man suit at a diner, pre­sum­ably Randy’s Donuts, which we’ve seen in film­ing. Accord­ing to the SDCC footage, which pre­ma­turely leaked on the inter­net, this scene will fea­ture Stark talk­ing to Nick Fury (Samuel Jack­son), Jack­son was also spot­ted in the vicin­ity of Randy’s Donuts dur­ing filming. 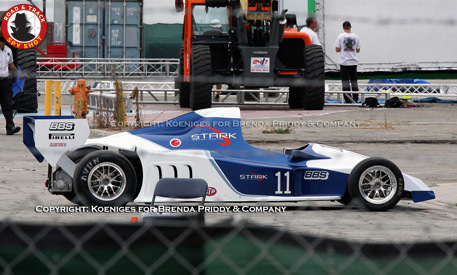 Via Jon Favreau’s twit­ter feed and “Road & Track”, we’ve got a pic­ture of Tony Stark’s Grand prix racer. 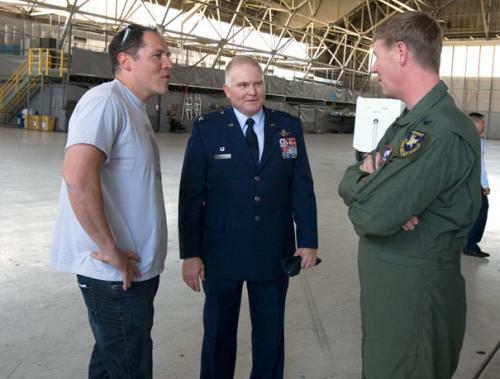 This will form part of the Monaco action scene, which pre­sum­ably also fea­tures Whiplash (Mickey Rourke). 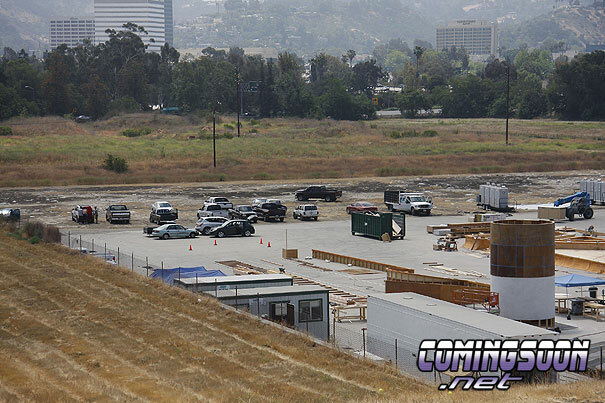 We’ve pre­vi­ously seen set pic­tures from Downey Stu­dios, Cal­i­for­nia, which show a replica Monaco race­track being built. Astute fans have also noticed the shape of the Mon­cao GP track on Tony Stark’s com­puter screen in the first offi­cially released Iron Man 2 image. Here’s Mickey Rourke in full Whiplash cos­tume. Click the image for a high res version. Whiplash (Mickey Rourke) sports a power pack on his chest that looks sim­i­lar to the one that Iron Man (Robert Downey Jr.) uses. 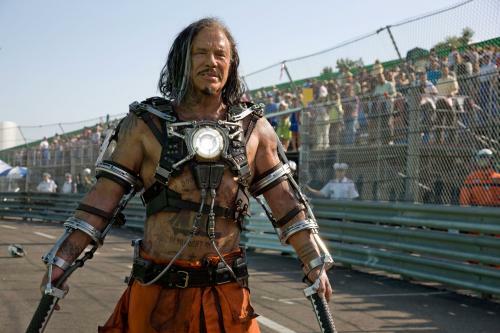 The villain’s alter ego, Ivan Vanko, is a Russ­ian who “has con­structed his own ver­sion of a suit,” Favreau says. Among the cre­ative inno­va­tions: a pair of whips, pow­ered by the suit’s glow­ing chest piece, that are expected to keep Iron Man cracking. 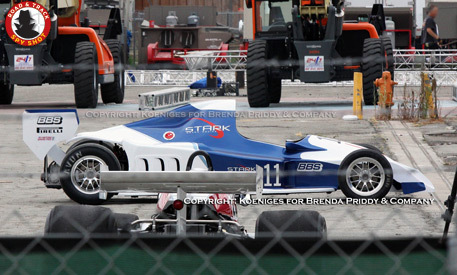 This first image of the char­ac­ter shows Whiplash mak­ing an appear­ance at the Monaco His­toric Grand Prix. Favreau as usual is tight-lipped about plot points and declines to dis­cuss whether the big-screen Whiplash is, as in the Mar­vel Comics, a weapons designer who works for Justin Ham­mer (Sam Rock­well), a com­peti­tor of Tony Stark/Iron Man. “We like to play into and against the expec­ta­tions that peo­ple might have, so we mixed it up a bit,” Favreau says. Rourke’s per­for­mances in Sin City and The Wrestler helped con­vince the direc­tor that the actor was the best can­di­date to face Downey in his sequel to last spring’s block­buster that grossed $318.4 million. 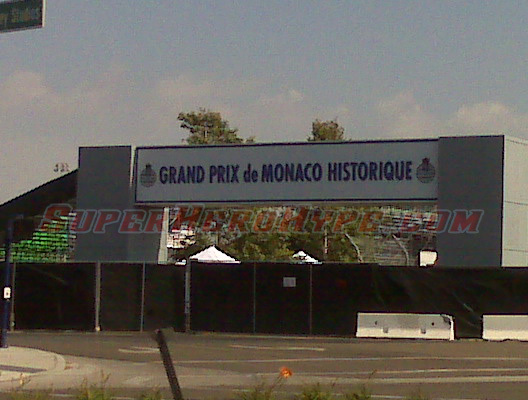 We recently reported that the Iron Man sequel would be film­ing some big actions scenes at the Monaco Grand Prix. With this in mind, the lat­est news is that the Iron Man 2 crew are build­ing an enor­mous Monaco GP set com­plete with replica race­track at Downey Stu­dios in Downey, California. 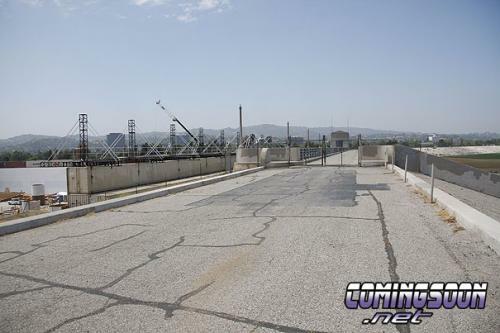 This is sup­posed to be the famous car rac­ing scene where..stark is drunk as iron­man and gets pissed because he bet on a race car that is los­ing and sab­o­tages the races and blows up all the other cars..causing himm to fear is a hero or a nat­ural villain…good stuff? Scenes from the upcom­ing movie Iron­man II were filmed here May 11 through 13, with the sup­port of about 60 mem­bers of Team Edwards tak­ing part as extras and tech­ni­cal advisors. 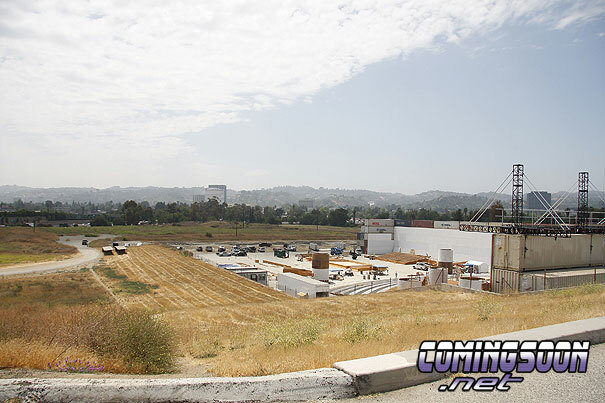 The direc­tor, Jon Favreau said he was excited to return to Edwards for the sequel for the land­scape, but not for the way it looks but for the his­tory it pos­sesses and the pro­fes­sional Air­men and Marines here. Com­ing Soon were sent some pic­tures of a con­struc­tion site bear­ing the ‘Rasputin’ work­ing title at the entrance. 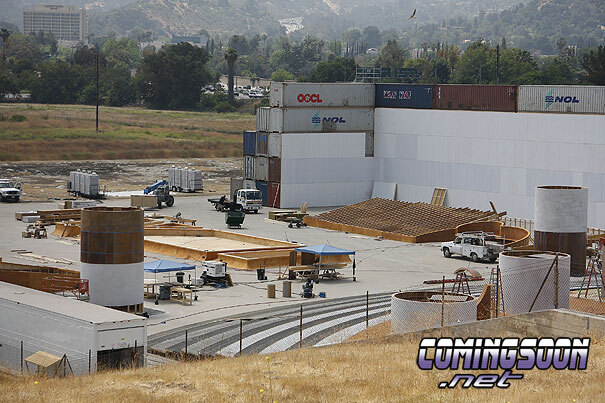 It all looks very big. You can find this at the foot of the Sepul­veda Dam in L.A.
On Loca­tion News have posted a selec­tion of overly water­marked ‘for sale’ paparazzi images from the lat­est Randy’s Donuts shoot. Due to the com­mer­cial nature of the images I can­not include them here, but I can give you guys the link and a screen­shot of the thumb­nails. 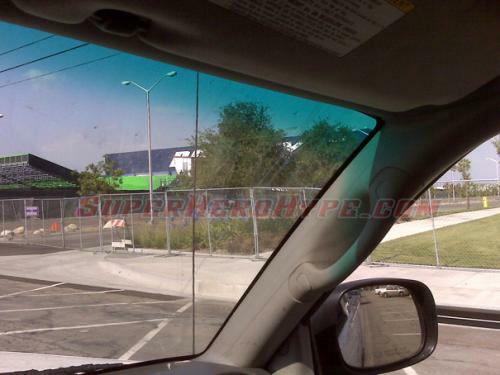 This is our first look at Nick Fury in Iron Man 2, with the famil­iar eye patch and trench coat. There are also many more shots of Robert Downey Jr. in the Iron Man suit, one includes the hel­met being passed to him. 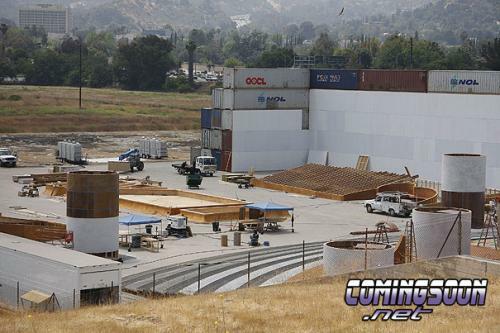 MAY 6th LOS ANGELES, CALIFORNIA **EXCLUSIVE** Robert Downey Jr. film­ing Iron Man 2. 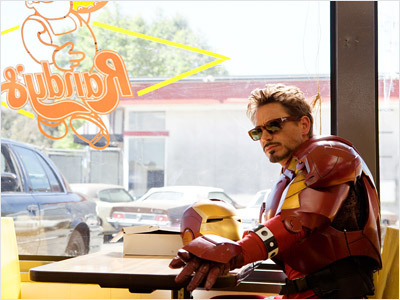 In this funny scene, Iron Man takes a dough­nut break in the hole of a giant dough­nut shop sign which is an LA land­mark. Samuel L. Jack­son as Nick Fury is below and ask Iron Man if he would like some cof­fee with his doughnuts. My friend – let’s call him James — said that film­ing at the loca­tion lasted between 45 min­utes to an hour and there were tons of pro­duc­tion assis­tants and pro­duc­tion peo­ple around the set. That’s the rea­son why we don’t have a new pic­ture for this article…he never felt like he could take out his cam­era and get the shot. 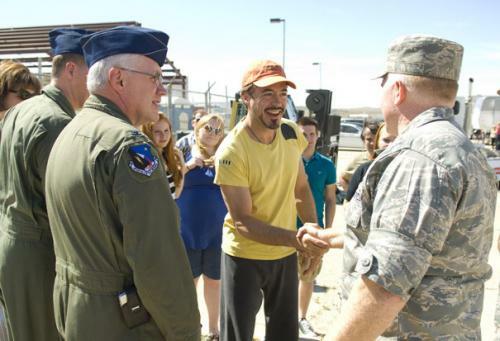 Any­how, James said that he saw a stand in for Robert Downey Jr. (Tony Stark) on set and that he watched Nick Fury race up to the donut place in a blue gov­ern­ment car and he got out and walked to his right to get a bet­ter view of where Iron Man would be. The cam­era was on a crane. James said it appeared that Iron Man was going to be in the donut hole on the roof and that Nick Fury was yelling at him, but he couldn’t hear what he was saying. 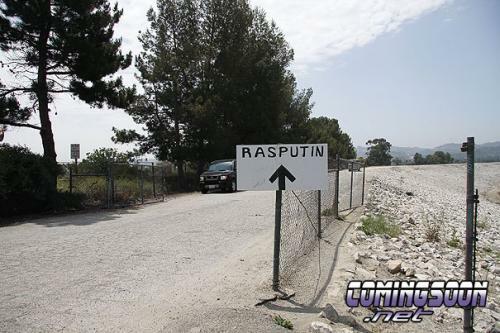 He also reported that Sam Jack­son was in the same cos­tume as the end of the first film – a long black trench coat.